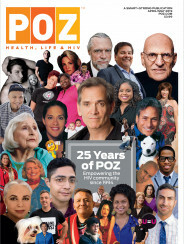 In a blog post titled “HIV Does Define Me: There, I’ve Said It,” POZ blogger and long-term survivor Bob Leahy reflects on the ways that the virus shapes our lives, whether we like it or not. Here is an edited excerpt. It’s the clarion call of many a budding activist: “HIV does not define me.” It’s an admirable sentiment too. It speaks of empowerment, of mastering challenge, of defiance, of retaining a clear sense of identity and of priorities. At the same time, I can’t help but think that, manageable condition or not, HIV does define me and many others. It shapes our lives. Pre-diagnosis years, I suspect, are universally much different from post-diagnosis years. That’s even more so for long-term survivors, who now constitute a large faction within the HIV community and who inevitably bear scars from living through the worst years of the epidemic. 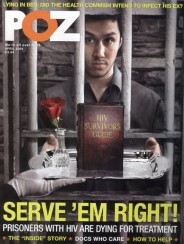 And as a result of criminalization, we can be charged with serious offenses our HIV-negative neighbors cannot. We grapple with stigma too—in all its forms—that our neighbors cannot even comprehend. Living with HIV is different. The result? I’m willing to admit that while the “HIV does not define me” sentiment is admirable, HIV has so changed my psyche in myriad ways that it does in fact define me. My biography inevitably starts with “Bob Leahy is a person living with HIV since 1993.” Clearly, I see myself first as a person living with HIV, even though symptoms are under control. I see myself as a person living with HIV who has spent a large chunk of my life writing and arguing and advocating around HIV. I see myself as a person living with HIV whose life changed very dramatically the day I was diagnosed. Almost overnight, I went from banker to activist. HIV has shaped my life ever since. That kind of change isn’t always a bad thing. (Anything beats banking!) I’m not here, though, to debate whether an HIV diagnosis is a good thing or a bad thing—it can be both. That it is a life-changing thing seems hard to dispute. The change can often manifest in big ways. How we see ourselves—as strong and powerful or as damaged goods—is an example. So in my own case, I would like to think I’m not defined by HIV but in many ways I am. I can’t help it. Until recently, for example, my work days were consumed with reporting on HIV, my colleagues were people dealing with HIV themselves, my wonderful social media circle is full of people living with HIV, sharing thoughts and news about HIV and sometimes wearing HIV-themed T-shirts. I can’t be alone in thinking that for a large chunk of my life—a quarter century in fact—I have been consumed by HIV. If that’s not a life defined by HIV, I don’t know what is. True, I live a life where family and friends outside the HIV world play a huge part. My dog is everything to me, and so is my longtime partner. But then researchers see me as part of a serodiscordant, or mixed-status, couple, never once as a dog lover. Our outside lives are seldom acknowledged within our own community. Instead, we are required, or choose, to put on an HIV hat again and again and again. I don’t resent that. In many ways, I like being a person living with HIV. It has given my life meaning and purpose, even if in an all-consuming way. I don’t feel the need to downplay that. Rather, I celebrate that having HIV has shaped my life, shaped my identity and—yes—defined who I am.